While the run-up to Christmas is a time of celebration for many, it can be a tough time for some veterans. Remembrance Day commemorations often stir up painful memories. The risk of debt and homelessness can spiral. And Christmas on civvie street can still feel unfamiliar and confusing. 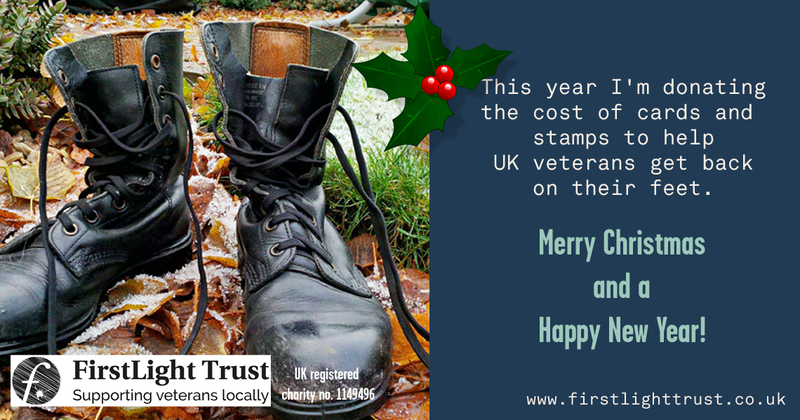 FirstLight Trust helps veterans of the armed forces and bluelight services who need help getting back on their feet. We run hubs across the UK which are great spots for the public and veterans alike to enjoy coffee, cake and company. But each costs around £120,000 a year to keep going. We’d also love to set up clinics, drama, art therapy sessions, Coping Strategy Sessions and Emotional Intelligence techniques. Plus expand activities like gym sessions and gardening. 1. No time to send Christmas cards? Don’t panic! Email, WhatsApp, tweet, Facebook message or print out this page’s header image instead and make a donation. We’ve world-exclusive merchandise featuring quotes from the Sharpe series, written by our patron Bernard Cornwell. Sean Bean famously led The Chosen Men from The Rifles, battling Napoleon on TV. Buy in person: Just pop into one of our hubs to see the full range. 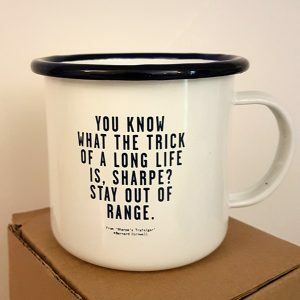 Buy online: Our enamel mugs with the quote “You know what the trick of a long life is, Sharpe? Stay out of range.” can be ordered online. Sign up for Amazon Smile and chose FirstLight Trust as your nominated charity. Then shop using the Amazon Smile web address instead. Amazon will give us 0.5% of the amount you spend, at no cost to you. Clueless as to what to give The Person Who Has Everything? Why not make a donation on their behalf? Check out the many ways to donate, even if you’re in the USA. Are you clearing space for new Christmas gifts? Please take your unwanted clothes, bric-a-brac and homeware to our Redcar or Scarborough shops. You’ll get a proper brew plus a friendly smile from our colleagues. 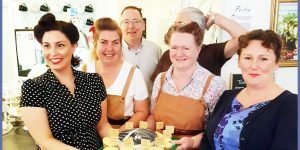 From monthly raffles to Christmas fairs, our hubs hold lots of great events. Pick up delicious home-made bakes as well as Sharpe mugs and bags. Check out what’s happening. Thank you for your support and a very Merry Christmas from us all!